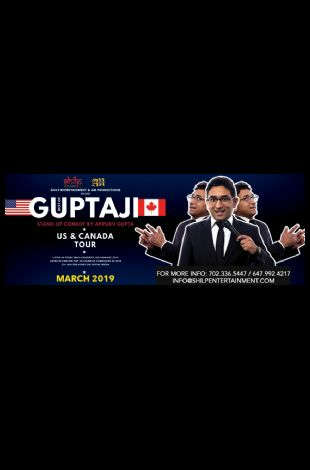 Please note Vancouver: Best of GuptaJi - Stand Up by Appurv Gupta occurred in past. Engineer turned Stand-Up Comic, Appurv Gupta a.k.a has one of the unique voices in the Stand-Up Comedy scene in India. CNN-IBN has listed him in the Top 20 Stand-Up Comedians to watch out for. Comedy Central India says that he is India's leading Hinglish Stand Up Comic. Regularly Feature on NDTV Prime. Recently, Forbes India had listed his name in the Forbes India Celebrity 100 Nominees list. Note: We provide all Indian (desi) events. Your source of all the Desi Indian events happening in and around Vancouver, Surrey. BCIndian.com has tried it's best to provide accurate information, we request you to check our site for updates. BCIndian.com is not responsible for any cancellations or changes in events.